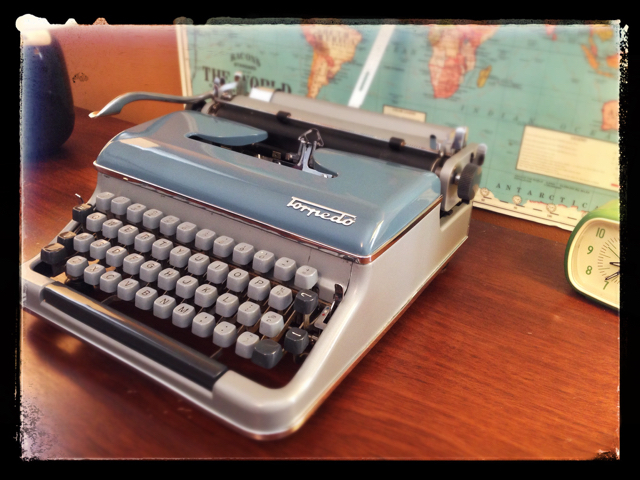 Like its weapon namesake, the Torpedo typewriter is sleek and fast. The keys move effortlessly and with fluid precision. If your goal is to conquer a large manuscript, this is your weapon. It has the solid feel of its German cousin, the vaunted Olympia SM3, but without the cumbersome carriage shift. Perhaps the Torpedo’s design was influenced by its American parent company, Remington Rand. The easy going basket shift seems to be common on most American typewriters. Everything about the layout of the Torpedo is right where you need it. The paper advance lever has a long curved sweep to it, making it easy to catch with your fingers. And for the computer influenced, the backspace is on the upper right of the keyboard. If your typing is anything like mine, every once in a while you might skip a character. I always feel compelled to go back and correct this gap. Normally, I’d advocate just ignoring these lapses when writing with a typewriter, but old habits die hard. One feature of typewriters I tend to ignore is the paper bail. This is what holds the paper to the platen with its rubber rollers. On many typewriters there doesn’t seem to be much thought to its design, not so on the Torpedo. But what’s the big deal with a paper bail? Normally, I’d agree, but the more I observed my habits, I often found myself lifting the bail to review the last few sentences. On the Torpedo the paper bail has easy to reach tabs and a solid spring that snaps it back with precision. The last feature of a typewriter I always find helpful is a paper support with a page length indicator. This is a little metal stop on a retractable paper support so that when the end of the page is reached, it comes to a rest against the stop. Like Olympia typewriters, the Torpedo has this helpful feature. Lastly, the Torpedo’s carriage glides smoothly and only makes the slightest ratcheting sound. If you’ve ever used the ultra-smooth Olympia SM3, the Torpedo has a similar feel. It’s easy to fall in love with a Torpedo, they look beautiful and perform fantastic. It’s just too bad there aren’t more of them around like the popular SM3. I own one. Love it. It types in script! I live in Brazil and I have many typewriters, as different models of Olivetti, Remington, Olympia, Erika, Royal, Imperial and Torpedo. Torpedo 18 is at the top among my favorites. Thank you for your answer. I figured it would be best to respool any 13mm ribbon onto my old pelikan metal spools (is it normal, that only one has the pelikan logo on it?). I got a Torpedo and everything seems to work, except for the ribbon spool won’t turn/spin to advance the ribbon after each key stroke. I have looked all over the place to determine if maybe it’s a missing/loose spring. I don’t have a typewriter repair guy in Austin. Anyone have a suggestion would be greatly appreciated. I know this is a little late, but there used to be a repair shop in Austin listed here http://site.xavier.edu/polt/typewriters/tw-repair.html and I know there are several very capable collectors there. If none of that works out & you ever find yourself up near Dallas, i’d be happy to take a look at it for you. I have extensive experience working on Torpedo’s and even have a model 18 parts machine. Best of luck!